Black Friday sales kind of sucked this year, but that doesn't mean the retail business is doomed. The holiday season accounts for 20 percent of annual retail sales, so while we can smugly mock the odious displays of greed at malls and big box stores all over America, it's still a good thing for the economy that people want to buy and fill their houses with lots of expensive crap marked down to sell in a short time. But for many, the tradition of getting those deals on Black Friday weekend at actual brick and mortar stores may not be as big of a deal anymore. According to the Associated Press, sales are expected to drop 11 percent this year for the long weekend. 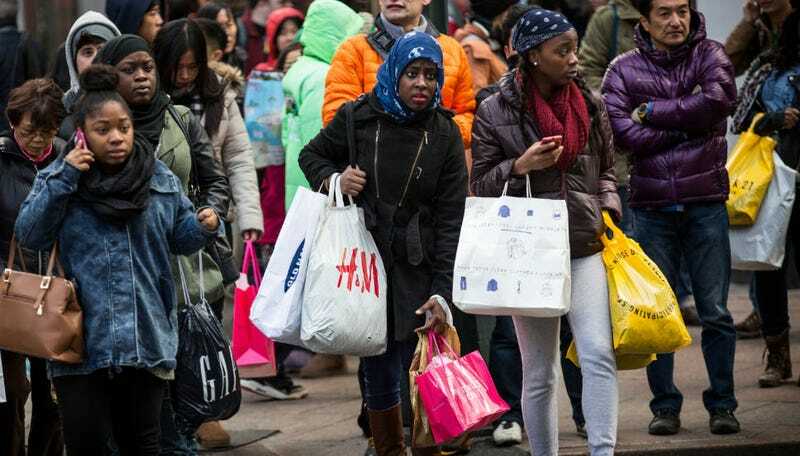 Overall, 133.7 million people shopped in stores and online over the four-day weekend, down 5.2 percent from last year, according to a survey of 4,631 people conducted by Prosper Insights & Analytics for the trade group. Total spending for the weekend is expected to fall 11 percent to $50.9 billion from an estimated $57.4 billion last year, the trade group estimated. In stores, shoppers spent $9.1 billion on Black Friday, according to research firm ShopperTrak, down 7 percent from last year. That was partly due to a 24 percent surge in Thanksgiving sales, to $3.2 billion. Turns out the obnoxious habit of big box retailers pushing back their big sale dates earlier and earlier is drawing away from the allure of Black Friday. Starting the mad sale season super early steals the thunder from the anointed sale weekend. Plus, online shopping continues to grow as people realize they can sit around in their pajamas eating cold leftover turkey sandwiches instead of getting trampled to death in mad shopping rushes. Target said Thanksgiving saw a 40 percent surge in online sales and was its biggest online sales day ever. And Wal-Mart reported Thanksgiving was its second-highest online day ever, topped only by Cyber Monday last year. From Nov. 1 through Friday, $22.7 billion has been spent online, a 15 percent increase from last year, according to research firm comScore. On Thanksgiving, online sales surged 32 percent, while Black Friday online sales jumped 26 percent. But all hope is not lost! According to the National Retail Federation the season is still predicted to bring a 4.1 percent increase in sales, which is the highest gain since 2011. So the fade of Black Friday doesn't mean the retail business is SOL. No word yet on whether #NotOneDime, the grassroots Black Friday protest that started and spread on Twitter in response to a grand jury's decision not to charge Ferguson police officer Darren Wilson in the killing of Mike Brown, made much of a dent nationwide. At any rate, the effort successfully shut down "several" St. Louis area shopping centers on the biggest shopping day of the year.